When it comes to shopping in India, Delhi is the place. The city has a multitude of markets with a diverse array of handicrafts and other items from all over the country. The biggest and most renowned market, Dilli Haat, has been specifically set up by the government to provide a platform for artisans to come and sell their wares. It gives the feel of a traditional weekly village market (called a haat) and offers cultural performances and Indian cuisine as well. The concept is hugely popular. There are three Dilli Haat markets in Delhi. The original six-acre Dilli Haat opposite INA Metro Station (Yellow Line) in south Delhi, established in 1994. The 7.2-acre Dilli Haat near Netaji Subhash Place Metro Station (Red Line) at Pitampura, in north Delhi, established in 2008. The newest and largest 9.8-acre Dilli Haat on Lal Sain Mandir Marg at Janakpuri, near Tikak Nagar Metro Station (Blue Line), in west Delhi. It was inaugurated in early July 2014. 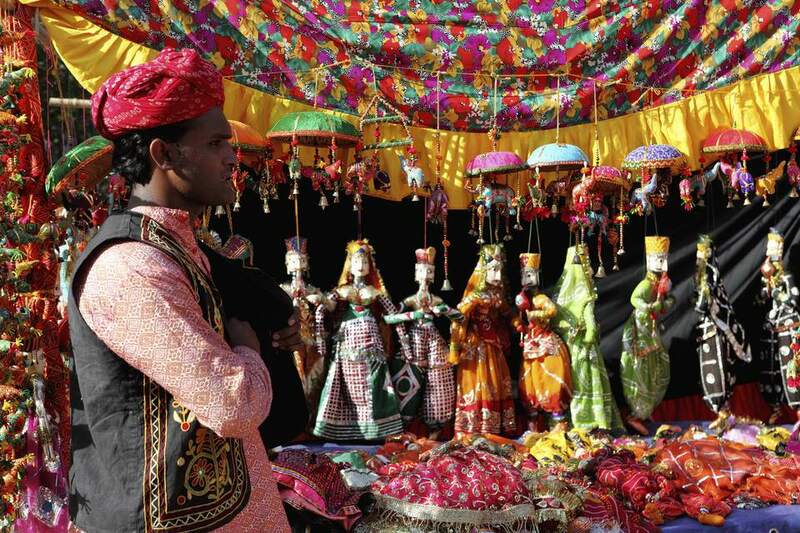 Which Dilli Haat Should You Visit? In this case, the original is best. Although they're larger, the two newer Dilli Haats have failed to replicate the ambiance or success of the first INA Dilli Haat. Their spaces are underutilized and require further development, especially in regard to the number of handicraft and food stalls. Both haats have much less variety than the INA Dilli Haat, and stalls are sitting empty. The Dilli Haat at Janakpuri has more happening than the one at Pitampura. However, unless it's a weekend or there's a festival taking place, both remain quite deserted. While each Dilli Haat has a different design, common features of each are handicraft stalls that host artisans on a rotational basis, some permanent shops, and a food court serving cuisine from all over in India. (The momos from northeast India at INA Dilli Haat are among the best in the city). Dilli Haat at Pitampura was built with the addition of a spice market, art gallery, and sculpture display. Unlike the other two haats, Dilli Haat at Janakpuri was developed to provide a much-needed place of entertainment for local residents and it has a theme: music. A music library, where it's possible to trace the history of Indian music through records and books, is a special feature. There's a dedicated museum that displays Indian music instruments and other music-related artifacts, as well. Interactive performance spaces are a big focus. Janakpuri Dilli Haat also has a large amphitheater, modern air-conditioned auditorium, and exposition hall for exhibitions and workshops. Tourists will find some off-beat attractions near Janakpuri Dilli Haat. These include Kumhar Gram Potter's Village, Tihar Food Court, and King's Park Street. Tihar Food Court, on Jail Road, is a restaurant run by Tihar Jail inmates. It's an inspiring rehabilitation initiative. King's Park Street, about 15 minutes from Janakpuri Dilli Haat in Raja Gardens, is a cultural hub created from the transformed urban wasteland. One of Delhi's best boutique hotels is located in Janakpuri, too. What Can You Buy at Dilli Haat? The stalls at the haats are rotated every 15 days to ensure that the handicrafts on sale remain fresh and diverse. However, a lot of stalls sell the same thing, and the items aren't unique. Popular items include bags, cushion covers, embroidered and woven fabrics, wood carvings, shoes, carpets and rugs, saris and other ethnic wear, leather items, jewelry, and paintings. Make sure you haggle to get a good price. Here's how to bargain at Indian markets. Unfortunately, cheap imported Chinese products are starting to be sold at Dilli Haat, which is disappointing and concerning. This stems from the fact that an increasing number of stalls are being occupied by middlemen and traders rather than genuine artisans. If you're particularly interested in shopping for handicrafts and are looking for unusual products, you may find the offerings at Dastkar Nature Bazaar to be more appealing. It's located about 30 minutes south of INA Dilli Haat, near Qutub Minar and Mehrauli Archeological Park. For 12 consecutive days every month, it has a new theme featuring artisans and craftsmen. There are also permanent handicraft and handloom stalls. Regular festivals are held at each Dilli Haat. These include the Great Indian Food Festival in January, Baisaki Festival in April, Summer Festival in June, the International Mango Festival in July, and Teej Festival in August. Regional folk dances are another highlight. Check local event listings to find out what's on where and when.